placement - Need advice on a scrolling situation where the item clicked is difficult to place - New and Fresh Private + Public Proxies Lists Everyday! I develop a graphical interface where I have a list of products on the left. When a product is selected, an information box appears on the right. 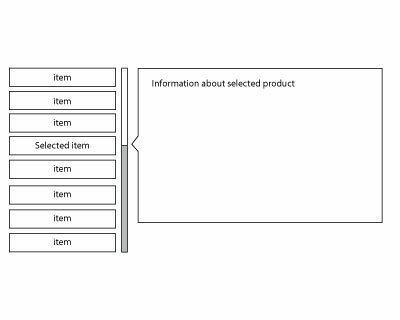 My problem is that the product scrollbar is placed to the right of the products (according to the convention), but this is not optimal because the scroll bar becomes a visual "wall" that separates the selected element on the left the information area for the selected product. I've considered putting the product list right, but this seems unacceptable because the attention runs from left to right. I've also tried placing the scroll bar to the left of the products, but it breaks with the learned cultural standard that a scroll bar is placed to the right. Next Next post: [ Politics ] Open question: I want Trump to lose so badly in the next election. It would damage his ego so much. You?